To change or not to change, that’s a big question. I don’t know about you but I’m pretty attached to my surname, it’s been a part of my identity for, well, my entire life. Tradition dictates that when I decide to get married I should take on my husband’s surname. But isn’t that a little outdated? We’re striving towards equality in all other areas of our lives, so why are we so willing to give up such a large piece of our identity simply because it’s the done thing? Freelance beauty editor Aisling Keenan is getting married in September, and whilst she’s busy planning menus and seating plans, changing her surname is not on the agenda. Whilst lots of women decide to keep their names for professional reasons, for Aisling, it’s the ideology around changing her name that jars. She explains, “I’m aware it’s what lots of women do, but the very fact that it’s women who do makes me uncomfortable. Why just us? Professionally it makes sense for me to keep my name too, but honestly it didn’t even come down to that. My name is my name, and always will be. It wouldn’t feel right to change it. Whilst it’s becoming increasingly common for brides to retain their maiden name once they’re married, it’s not the only option. The idea of merging surnames is an alternative that has become a lot more popular in recent years too. Tradition dictates that a bride changes her surname when she gets married, but what if she doesn’t want to? It’s not just women who are willing to start married life with a little compromise. 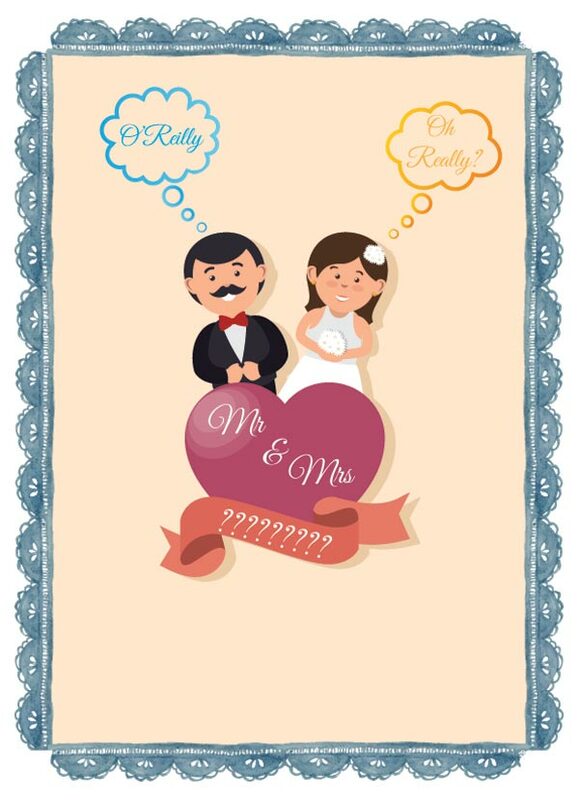 When digital creative director Seán Cannon-Earley got married to his wife Mary in 2011, they decided on a double-barrelled surname that they would both share. For them it was all about keeping both sides of family heritage intact. Seán explains, “Mary is close to her family and didn’t want to lose her connection with family heritage, but she was also keen to share a surname with me. I suggested that we double-barrel our surnames and have both.” The best of both worlds, who can argue with that? For Matt, the reaction has been overwhelmingly positive. “My mom was so proud, but I’m fortunate enough for that to be a given in my life. I was nervous to talk to my dad, but he was impressed by my choice and backed me 100%. Some distant family members were surprised, and it took them time to get on board. It was my brother who put me on the best footing, reassuring me a name change could never make me any less his brother.” But what about strangers? “Surprise still seems to fill that first reaction. It’s an uncommon practice, even in the progressive cities I tend to live in. However, it’s often followed closely by excitement. I think it’s because people get excited by the idea there are choices in their lives.” And that’s what it comes down to, choice.